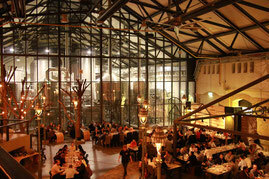 How to enjoy good German beer in Berlin! 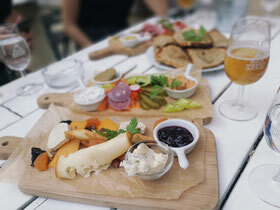 Find out why handcrafted beer is such a big trend in Berlin and walk & taste your way through the city. In my BeerBerlin travel guide you will find three walks through Berlin’s most creative neighborhoods and a selection of my favorite restaurants, beer gardens, breweries and activities in Berlin, where (non-)beer fans will have the best time. Ich bin ein Berliner. I would like to take you on a walk through my city. BertaBerlin is a locally curated collection of secret spots and hidden gems crafted so you can explore Berlin with ease by way of simply suggested city walks or more spontaneous choose-your-own-adventure routes. The pocket-size guide map includes the sights and attractions not to be missed in addition to the word on the street to make the most of your experience. But for now, here are my favorite discoveries while scouting for the BeerBerlin Map! Did you know you can combine two bottles of beer with yoga? With these two together, people have been relaxing their mind, body and spirit for centuries. The exuberance of drinking beer in combination with the body awareness of yoga makes for an energizing experience. Cheers! Labor Berlin is the creation of Hungarian brewery Mad Scientist, which has a similar location within Szimpla’s namesake “ruin pub” in Budapest. There as in here, the “science” theme runs strong. The brews themselves tend toward the experimental, like the fruity Mango Bay or the creamy, mocha-infused New York Mocaccino. The selection of 12 rotates constantly; try the award-winning, nine percent ABV Liquid Cocaine if it’s on tap or, the unique beer slushy. PS: The ice cream was too good, so it disappeared before the photo was taken, sorry. Would you like some bread out of beer? Here you find more than beer, e.g. bread made out of beer ;). The Stone Brewing World Bistro & Gardens provides a destination restaurant devoted to celebrating artisanal food & beer and features up to 75 beers on tap, making it the largest beer selection in Germany. They also offer guided tours through the brewery! The KINDL - Center for Contemporary Art in Berlin is an exceptional exhibition venue. Since 2016, important positions of international contemporary art have been shown in the building complex of the former Kindl Brewery in Neukölln. 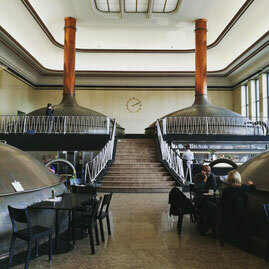 In the impressive hall of the former brewhouse is also the Café and beer garden König Otto at home. A brewery without beer! Can you imagine?! well, you find it in the Deutsches Technikmuseum in Berlin. Beer is a pure natural drink produced by alcoholic fermentation and has a history of over 6000 years. This is reason enough to elaborate on the technology of beer production in the museum. 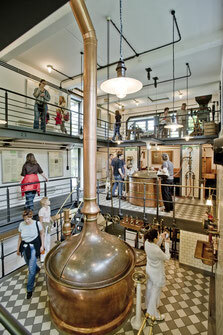 So the Historische Brauerei (historical brewery) hosts free guided tours. Just check their website!